Like most of the U.S. (of a certain age anyway), I’m slogging my way through Ken Burns’ Vietnam on PBS. Since I was a youngster back then, it’s been educational to fill in the blanks of my memory on the War that Won’t Go Away. I’ve been relearning the terms “Viet Minh,” “Viet Cong,” and what ARVN stood for. Like the U.S. Civil War, I wonder if the Vietnam War will ever really go away. In earlier conflicts, the memory would fade once the last living combatants passed on. But these days…with video and the opportunity to relive it in such detail, I wonder if the technology is dooming us to forever relive old battles and reopen old wounds. The initial stirrings of anti-colonialism happened before the First World War. Heck, the actions of Gavrilo Princip in Serbia were motivated by that and started the whole mess. The men who would become Ho Chi Minh and Mahatma Gandhi were contemporaries and were each using similar methods to create change in the post-WWI period against the French and British. 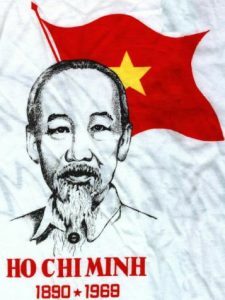 There’s a lot of debate regarding how “radicalized” (to use a 21-century term) the future Ho Chi Minh was during his time in France between 1911-1925. In the Ken Burns documentary, the narrator talks about how Ho pens a letter to President Woodrow Wilson, in Paris taking part in the Armistice talks and the development of the League of Nations, asking for the same rights of Self-Determination be applied to his nation, Vietnam. No one knows if Wilson ever saw it. When Gandhi returned to India in 1915, his journey began towards who he would become — seeking self-rule, and setting up social programs for the Indian people that would eventually become Indian independence and partition, after World War II. Recently you may have seen Morgan Freeman’s video that posits a similar storyline. The fall of the Soviet Union was a cause for celebration in the West, but for folks on the ground in the former U.S.S.R., it was painful — little or no food, little hard currency, and not a lot of help from the West. It would easy for a young KGB operative named Putin to turn bitter, and become “radicalized” against the West. So…what opportunities to Think Outside the Box are we overlooking now? An Apple for Teacher. A really big one.